Increased documentation demands, whether due to meaningful use requirements or EMR implementations in general, continue to plague physicians and force hospital systems to scramble for solutions. Is there a remedy that satisfies both physicians and patients? Many hospitals view medical scribes as a possible tonic to the problem, especially in the emergency department (ED), where time is of the essence. "Increased EMR documentation requirements result in physicians spending more time entering data and less time interacting directly with patients," says Kathleen Myers, MD, FACEP, an emergency physician and founder and chief medical officer of Essia Health, a provider of EMR implementation specialists and medical scribes. "Physicians who use EMRs in the exam room spend about one-third of their time looking at the screen. In addition, documentation requirements typically mean longer work hours for physicians. For every 60 minutes of clinic time, physicians spend about 30 minutes charting, typically after hours on personal time." According to Myers, medical scribes enable physicians to focus on patient care and maintain quality of life while meeting EMR or other documentation requirements. But do any efficiency and cost gains make up for the privacy concerns that patients may see from such an intrusion in their physician-patient relationship? Experts weigh in on the pros and cons of using medical scribes—and the realities of the health care system that make these professionals so in demand. What exactly do medical scribes provide for a hospital system? That varies based on the facility, but M*Modal Chief Scientist Juergen Fritsch, PhD, describes them as trained medical information managers who specialize in charting physician-patient encounters in real time during medical exams. According to Peter Reilly, CEO of the American Healthcare Documentation Professionals Group, scribes take care of the primary clerical and other nonclinical duties for a physician, who can then focus more intently on direct patient care. "By focusing on, for example, data collection and its documentation in order to establish a rapid and smooth workflow, the physician is relieved from having to make time-consuming phone calls and can prepare to see the next patient, answer a nurse's concern, or perform the next patient procedure," he says, adding that scribe duties go beyond simply documenting patient exams. "The scribe will also actively track down delayed lab results, CT scan readings, and any other pertinent information in order to increase the accuracy and velocity of the completed medical record and, ultimately, increase patient throughput. This will allow the physician to prioritize tasks he or she must accomplish in a given time period." Scribes generally work on site, shadowing physicians during their patient interactions, but Fritsch says some work from remote, HIPAA-secure facilities, where they enter any patient-specific data (still in real time) directly into a hospital's EHR system. Cameron Cushman, vice president of sales and marketing for PhysAssist Scribes, believes scribes can be especially beneficial in the ED, an environment that requires plenty of documentation, but little time to get it done. "Scribes also work well in urgent care clinics or any practice that's clinic-oriented," he says. "They've made tremendous strides in orthopedics, urology, and with hospitalists. The opposite would be surgery at an ASC [ambulatory surgery center], where the patient already had 12 visits and is unconscious during the encounter." "Emergency physicians are faced with a remarkable cognitive load to move patient care forward," explains Maria French, president and CEO of Terra Nova Transcription and past director of the defunct Clinical Documentation Industry Association. "Each additional task, from ordering tests to documenting the encounter itself, adds a level of complexity, increasing patient ED length of stay and the opportunity for the physician to miss something. The constant interruptions in an emergency physician's workflow may put patient care at risk." Scribes can help lessen that load and maximize physician workflow efficiency, she says. "The scribe follows the emergency physician into patients' rooms, documenting pertinent elements of the exam findings as dictated by the physician," French says. "In summary, the scribe potentially frees the physician to increase patient contact time, better manage patient flow through the department, and increase productivity to see more patients." And it's not just physicians' workloads that scribes can help diminish. "Scribes can perform an array of nonclinical duties that lighten the load of nurses and techs, such as calling family members, printing discharge directions or information for their course of treatment, bringing warm blankets, etc," Myers says. As scribes take care of documentation and other nonclinical duties, it's up to the individual physician or the hospital how to make use of the time gained, "whether that is to see more patients, spend more time with their patients, or to simply leave on time at the end of their shift," Cushman says. He adds that having someone available whose primary function is documenting the medical record can help reduce errors and deficiencies. Myers also is impressed with the ability of scribes to improve documentation quality. "Studies have found 14.8% to 17.1% increases in relative value units per hour, or 2.1 to 2.4 units per hour per provider," she says, noting there are also cost efficiencies to be gained by using scribes. "Scribe programs can deliver positive return on investment, enabling physicians to see more patients in the same amount of time. Studies suggest scribe programs result in increases between 6.5% and 9.5% more patients per hour, or approximately 0.5 more patients per hour per provider." Using scribes also can help hospitals improve physician recruiting and retention, reduce provider overtime expenses, and lead to fewer patients leaving without being treated, Reilly says. With physicians untethered from their computers, he says patients likely will leave the facility with a better understanding of what was discussed during the encounter. Anything that leads to less computer time and more face time is definitely a good thing, French says. "An American Journal of Emergency Medicine study found that emergency physicians spent 43% of their time entering data into a computer, compared to only 28% of their time spent talking to patients," she says. "During a typical 10-hour shift, a doctor would click a mouse almost 4,000 times. Utilizing a scribe would provide more time for patient interaction—more time listening and less time entering information into the EHR, leading to a greater physician-patient experience." No solution, especially one addressing a multifaceted problem, is without risk—and that holds true for medical scribes. According to French, the greatest concern with scribes, as is the case any time you introduce another person into the process of documenting medical information, is accuracy—or a lack thereof. "Any time you have an intermediary on a medical record, you risk the potential for inaccurate information, which could impact patient safety," she says. "If incorrect information makes its way into the EMR, then any clinical decisions made down the road will be based on that information on file, which may have consequences downstream." The fact remains that even though scribes enter the documentation, physicians still must review the results. "Ultimately, the chart is the responsibility of the provider, not the scribe," Cushman says. ''Information entered into the EHR by medical scribes may not be complete or fully accurate, potentially resulting in negative impacts on patient care," Fritsch says. "The biggest risk is probably that many providers will not review the information entered by their scribes appropriately before signing off on patient documentation." It may take time for physicians to adapt to the workflow intricacies of partnering with a scribe. "Working with a scribe is a unique skill that physicians have to develop," Myers says. "It involves thinking out loud and talking more to your patient since you're speaking to your patient, but in reality you're speaking to your scribe so the information is documented in the EMR. "If you're not a physician who talks a lot to the patient, it will be hard for a scribe to follow," she continues, adding that many patients like hearing their physician's thought process. Because scribes typically accompany the physician into the exam room, there are privacy concerns. French says many patients may find the scribe to be intrusive, causing them to be less forthcoming with important information that could impact diagnosis and treatment. Myers says that while there were privacy concerns raised when scribes were introduced, patients have largely come around to their presence, especially when she explains their purpose. "When I bring my scribe into the room, I introduce him or her as my assistant, who is here to write down everything I say so that I don't miss anything important and I can focus on you instead," she says. "Patients appreciate that." Medical scribes perform similar tasks to those of medical transcriptionists (MTs), leading some MTs to wonder about their future. Is such a concern valid? Not exactly, says Jill Devrick, MPA, immediate past president of the Association for Healthcare Documentation Integrity and a product solutions advisor for 3M Health Information Systems. She believes the widespread adoption of EHRs is more of a threat to the livelihoods of MTs than the growing scribe presence. "It's more accurate to say that the implementation of EHRs is displacing MTs to some extent because in the EHR environment physicians are required to take on much of the burden of documentation themselves," Devrick says. "However, if it really was more efficient for a physician to handle the documentation requirements for each patient interaction, they probably would have been doing it all along. Medical scribes were introduced as one way to assist the physicians and reduce the pressure brought on by EHR documentation requirements, but medical transcription is still widely utilized as well, especially in inpatient and acute care settings." While scribes and MTs both help physicians capture patient data, they differ not only in where and when they document (scribes are generally onsite and document in real time whereas MTs listen to dictations and edit them after the fact) but also in their knowledge base and experience. "A medical scribe can be trained and on the job within a matter of weeks, but a medical transcriptionist's education usually takes at least 18 months for a certificate program or two years for an associate's degree program," Devrick says. "Some medical transcriptionists have bachelor's degrees and beyond, and many have completed certification as certified or registered health care documentation specialists to verify their body of knowledge and expertise." Because patients, physicians, and other clinicians are available to provide clarification in real time when necessary, scribes typically don't need a deep level of medical knowledge, she notes. French says scribes tend to be university students or graduates considering a career in medicine, while MTs boast a more specialized knowledge base. "Scribes are usually premed college or gap-year students who are interested in a career in medicine," says Cushman, who says new hires at PhysAssist Scribes attend an intensive, five-day training program where candidates learn medical terminology and HIPAA and professionalism guidelines and receive personal coaching based on video scenarios in mock EDs. "Medical scribe management companies have leveraged the need today's medical schools have established to require their applicants to apply with a preexisting base of clinical experience and have used that as a motivator to get young premed students working as medical scribes," says Reilly, who also notes that more nonpremed students are entering the field. Myers recommends unemployed or dissatisfied MTs consider becoming a scribe. 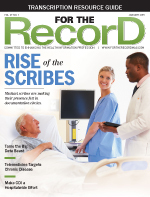 "As EMRs become more prevalent, the need for MTs continues to decline," she says. "Teaching them how to perform their services in real time, as a medical scribe, is a logical step for them." Although the responsibilities and skill sets are different, Devrick says a career as a scribe may be a good fit for MTs who enjoy the pace and interaction the position requires. However, she cautions it may be not be for everyone. "Yes, medical transcriptionists have great potential as scribes as long as the work they are asked to perform enables them to utilize their knowledge and experience," Devrick says. "If the position only entails following the physician around and entering data, they would probably get bored quickly." To go from reviewing, researching, and editing comprehensive documentation on complex histories, consultations, surgeries, and diagnostic procedures to recording vital signs and basic physical exams can be jarring, she says. "The medical transcriptionist listens to dictations and edits detailed documentation, usually in a separate environment, using knowledge and research skills to check for quality and accuracy in the context of the patient's current situation and history, as well as considering the described interaction with the physician," Devrick says. "The documentation handled by an MT is typically more in-depth narrative that explains how and why the physician is making specific decisions about patient care, and it is very important to have an individual with the education and experience of a medical transcriptionist to be the second set of eyes on the documentation to catch holes, errors, and inconsistencies that need to be clarified." In fact, she believes MT skill sets are more aligned with those of a clinical documentation improvement specialist than a medical scribe. Still, Essia Health has had success hiring former MTs. "It does require some retraining, not on terminology and vocabulary, but on site-specific flow and use of different EMRs," Myers says. "Being a medical scribe can be a great position for a former medical transcriptionist, and often they find they enjoy being in a clinical environment and part of the medical team." "For the right individual, being a medical scribe, senior scribe, or scribe manager offers a new and exciting career path leveraging the exceptional training and expertise developed being an MT," Reilly says. In an ever-evolving industry that requires enormous amounts of data to be recorded and stored, the demand on a practitioner's time is—and will continue to be—intense, French says. "The need for increased documentation will increase administrative requirements on clinicians and facilities," she notes. "Therefore, until the EMR is easily usable while providing the physician with time to have an acceptable patient encounter, there may be a need for medical scribes." Reilly believes any professional who can help alleviate this administrative burden will continue to be an asset to physicians and the health care system as a whole. "For the foreseeable future, the US health care system is faced with a well-documented shortage of competently trained clinicians," he says. "For the most efficient health care delivery system, the US will need to support the limited population of clinicians with individuals capable of alleviating any administrative, nonclinical burden. Whether you call this individual a medical transcriptionist, medical biller, medical coder, medical assistant, medical scribe, or something completely different, this role—or these roles—is here to stay." Reilly considers the presence of medical scribes a matter of common sense while likening physicians to a star quarterback. "The New England Patriots would not pay Tom Brady $27 million a year and then have him serve hot dogs in the concession stand at halftime," he says. "We need the right people, in the right roles, doing the right things to optimize our health care delivery system. Asking physicians to be data entry clerks is ridiculous."